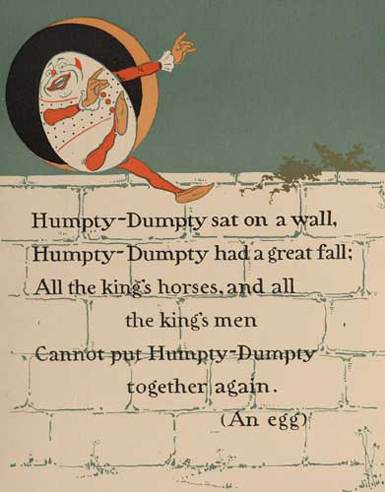 Ever had a Humpty-Dumpty experience? In reality, I'm flexible in some areas ... I could care less which restaurant we go to. I'm resilient to a point ... it takes a LONG time to get me to give up on something I'm committed to. But at some point, everything has a breaking point. Sometimes that breaking point appears long after the trial or test that generated the initial crisis. Have you been broken in faith or feeling, mind or body? Are you worn out by circumstances and situations that have challenged your beliefs, wounded your soul, vexed your knowledge, or damaged your body? Have repeated disappointments, losses, rejections, and trauma discouraged you to the point you feel shattered? Some people stop there and build an altar to the god of their brokenness. Their pain and suffering becomes their God. Others defy their brokenness and, like Monty Python's Black Knight, insist they've nothing more than a "mere flesh wound" and try to keep on fighting, in spite of mortal injury. Neither is a solution. Like poor Humpty (and the Black Knight), help isn't always found in our social circles. Most of the time we want to offer the quick fix when someone is in pain. We want to supply a suitably speedy resolution that will get them back in the saddle and back on the front lines, ASAP! But the truth is, sometimes recovery and restoration simply don't take place in a weekend, or a week, or even a month. Sometimes a conference or a retreat or a vacation help, but they aren't the solution to the problem. Sometimes, thank God, they do, but the severity of the wound may mean we have to access patience and faith to see ourselves, or our loved one, through to full restoration of spirit, soul, and body. "Pray for us. We have no doubts about what we're doing or why, but it's hard going and we need your prayers. All we care about is living well before God. Pray that we may be together soon. Make us into what gives him most pleasure, by means of the sacrifice of Jesus the Messiah. All glory to Jesus forever and always! Oh, yes, yes, yes." Pray for the shattered and broken and wounded around you today, and, if that describes YOU, trust that our loving God is at work right now putting you back together, making you whole. Where human effort (including your own) has failed to heal you, God Himself shall restore and renew your spirit, soul, and body! Feel like Humpty-Dumpty? Put yourself in the hands of your God and let Him put you back together, even better than before. It might take some time, and it will definitely require your cooperation, but it IS His will for you, according to His word! Very nice Niki. I think it's much harder to deal with the wait when it's for someone else. 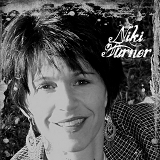 Wonderful thoughts, Niki. I'm pretty adaptable, but sometimes it takes a lot of prayers to stay that way. And you are so right, we usually want a quick fix when it's someone else. Boy, do I own that one. Well, I for one have been feeling pretty fragile lately. I needed this today. I am SO glad that I came to your blog today and read this post. I ABSOLUTELY needed this encouragement and insight for our current circumstance! Thank you for sharing such God-filled words! Excellent devotion, Niki. I appreciate your thoughts. God often uses your posts to get my attention. Dina, you are in my prayers today for strength and renewal. Heather, I hope you realize how much it means to us that you took the time to read and share your appreciation. Niki, now that the long day is done (I've been up since 4:30) I must say your FLESH WOUND graphic is even better the second time around. Lovely British humor/humour at its best. Thanks Suzie! I like the Message a lot. It makes it the word seem so applicable! Bless you, Heather! Thank you for your comments. Love it when the Holy Spirit confirms the word! Susie, that's encouraging to me! Thank you! Ah yes, Monty has helped me through some rough spots with his off the wall humor. The Holy Grail movie is my favorite. Coconut, anyone?